as free sample from Wishtrend with my last purchase. Yes, Wishtrend is very generous with free samples and gifts ( find more about the web shop in my 'where to buy Korean beauty products' post). For those who are unfamiliar with the brand Klairs, here’s a little background. The company is quit new, established in Seoul, in 2010, focusing on skincare problems for those with sensitive skin, products are suitable for all forms of sensitive skin. dry, rough, etc. 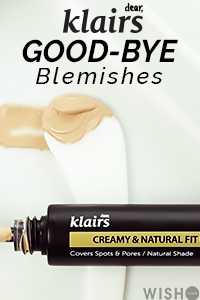 As can be expected from such a high quality skincare line, Klairs do not use any animal testing, products are all alcohol free, paraben free, free of artificial coloring, and eco-friendly. I have combination, acne-prone skin, I am usually oily on the check area and dry on the T-zone (I know strange). I have more or less managed my acne problem but sometimes I tend to break out and my problem of clogged pores and redness has not disappeared. On top of that my skin is also very sensitive. I have tried some sheet masks before that left my face red and slightly irritated, which was probably due to the alcohol. 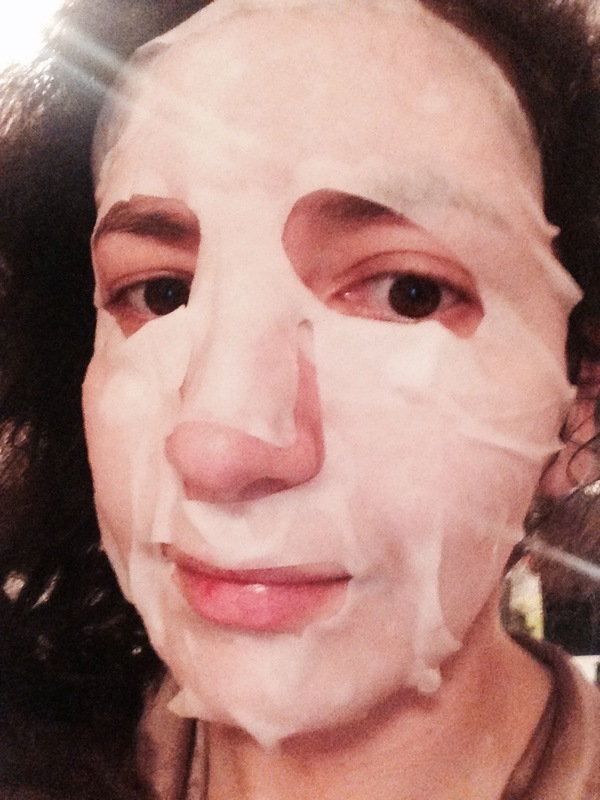 So, I was happy to try this sheet mask designed for sensitive skin. 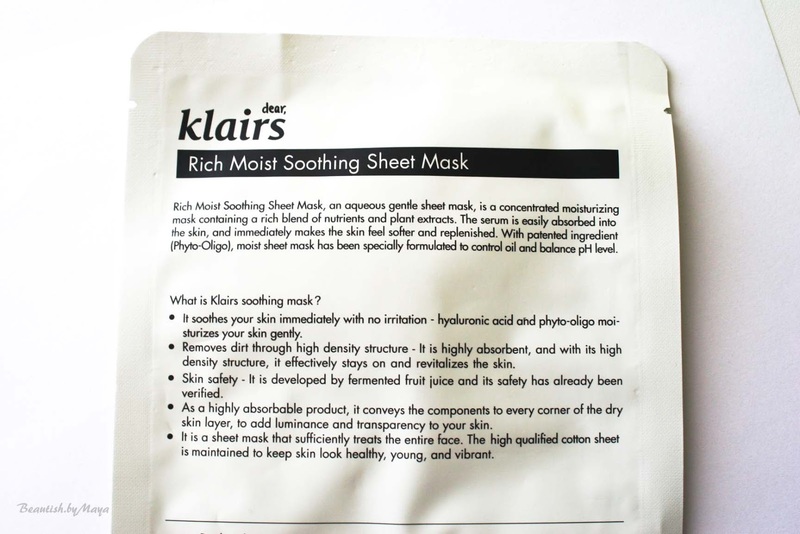 The Klairs Rich Moist Soothing Sheet Mask is very popular, the bestselling sheet masks on Wishtrend. It contains half a bottle of essence, sound amazing, you can imagine how well it must moisturize. Many sheet masks that contain a high amount of essence are on the expensive side but this one costs just 2 dollars. The sheet mask is produced from 100% cotton, which is really soft. As it's Eco friendly there is no additional plastic or paper to separate it from, but it is still easy to apply. Looking at the ingredient list there are no major red flags and only one preservative (see at CosDNA). As with all Klairs products the front of the packaging is written in English while the back side has Korean description. I really like the packaging design, it's simple but original at the same time and gives you that eco-friendly feeling. Product description Klairs: Special formulated moisturizing face mask for intensive hydration 100% pure organic cotton to minimize irritation and upgrade adherence. Directly delivers soothing essence to your skin. With main ingredient hyaluronic acid, you can see the long lasting and trouble soothing effect. Without any stickiness, the moisturizing face mask finishes of with refreshing texture. Abundant rich ingredients will be delivered to your skin after 15~20 minutes. Different from any other moisturizing face mask, even the most sensitive to troubled skin can use it without worrying about worsening problematic matter. Ingredients: Water, Sodium hyaluronate, Butylene glycol, Peg-60 hydrogenated castor oil, Dimethyl sulfone, Betaine, Natto gum, Disodium edta, Centella asiatica extract, Glycyrrhiza glabra (licorice) root extract, Carbomer, Arginine, Chlorphenesin, Tocopheryl acetate, Panthenol, Luffa cylindrica fruit/leaf/stem extract, Althaea rosea flower extract, Aloe barbadensis leaf extract, Fragrance, Portulaca oleracea extract, Lysine hcl, Proline, Sodium ascorbyl phosphate, Acetyl methionine, Theanine, Apium graveolens (celery) extract, Brassica oleracea capitata (cabbage) leaf extract, Brassica oleracea italica (broccoli) extract, Brassica rapa (turnip) leaf extract, Daucus carota sativa (carrot) root extract, Oryza sativa (rice) bran extract, Solanum lycopersicum (tomato) fruit/leaf/stem extract. 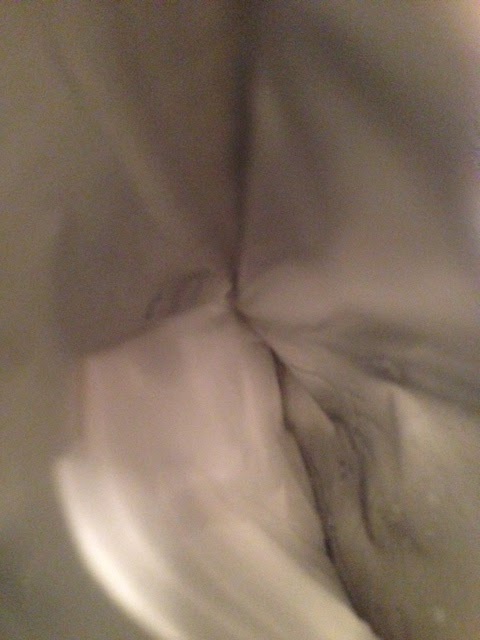 The mask is literally soaked in essence, 23 ml which is enough for more than one use if you have more cotton sheets.) I left the mask for about 20-30 minutes on my face. I tried to use all the essence don't want to waste anything, so I squeezed every bit of essence that was left onto my neck. The essence absorb quickly, you will have the impression that your skin is literally drinking it up. My skin felt very moisturized and refreshed and no tingly sensations or whatsoever, something I experienced before with other sheet masks. Even long after I had taken the sheet mask off my face felt fresh and hydrated. I woke up the next morning and my face was just literally glowing!! Really impressed with the mask. The oil control was good, no irritated pores or extra sebum production, something you can experience with other sheet masks. I will definitely repurchase this sheet mask. You can buy one for 1.99$ or a larger amount for cheaper. Wishtrend constantly has sales, deals and promotions, like buy 10 sheet masks and get 3 for free or 50% of the retail price. Interesting detail, 89% of customer who purchased this sheet mask end up repurchasing. In one word the Klairs sheet mask is just amazing, incredible moisturizing! It's suitable for sensitive skin, eco-friendly, contains no alcohol, parabens, mineral oil etc. 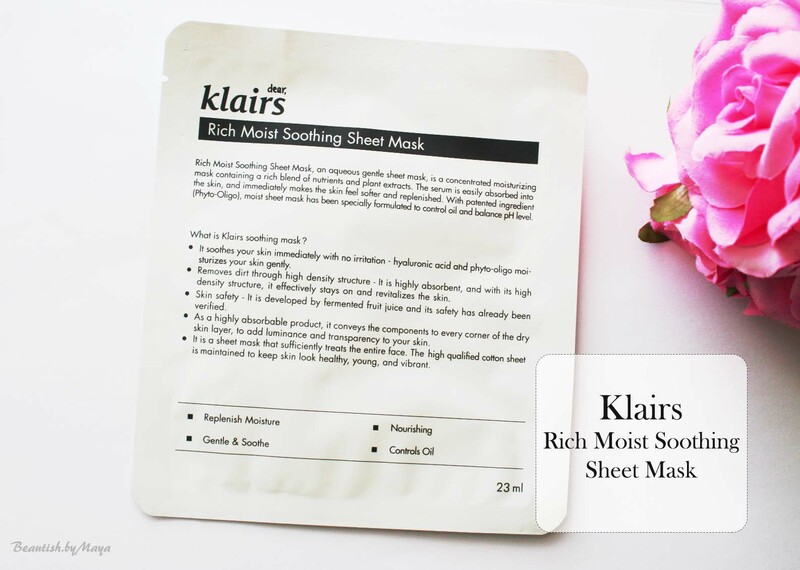 I would definitely recommend the Klairs Rich Moist Soothing Sheet Mask if you have sensitive skin and your main concern is dehydration. - Free of alcohol, parabens, mineral oil, coloring etc. I love sheet masks, they are so fun to use. 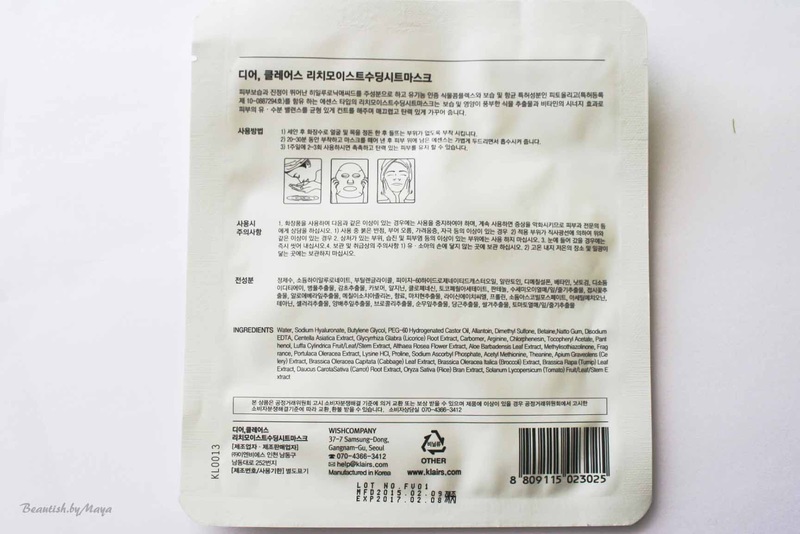 It is ) , I'm was really happy with this sheet mask, already order 10 more of them. They are my favorite for the moment. ooh that sounds great, really need anew face mask! Anything that is against animal testing is a okay with me! Looks good! i'm yet to try a sheet mask! You should try one they are great especially if you have dry skin, its like a small spa treatment but cheap.